Being a Master Instructor, classes are very important to Cindy. She really enjoys teaching, sharing and helping others. Cindy primarily teaches at her Creative Place in Portland, Oregon, but she also travels nationally to teach at other venues. Click on a venue below for class schedules and more information. Cindy opened Creative Place to give people a comfortable place to learn and shop. Creative Place offers workshops, supplies and kits for all your metal clay adventures as well as metal clay “Charming Parties” for fun and easy jewelry making events with friends. For location and shop hours, click here. This 5-day show is located at the Windmill Inn, a great exhibit and workshop venue that is part of the incredible array of bead shows that take place in Tucson in February every year. Creative Place will have a suite offering metal clay supplies and tools. Cindy will also be teaching classes. The world’s largest consumer bead show in the world! This grand event runs for over a week every year in Milwaukee, Wisconsin. Creative Place has a booth on the show floor selling merchandise. Cindy also offers many classes over the duration of the show. A wonderful weekend event that takes place every year in Oakland, California. Great shopping and three days of classes. Creative Place has a booth on the show floor selling merchandise. 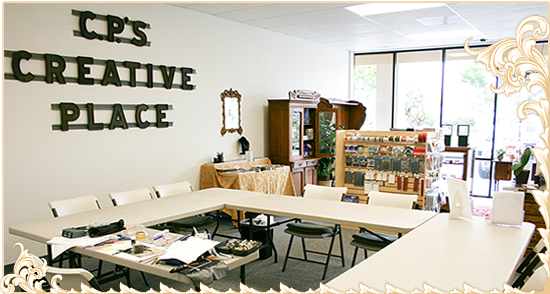 Cindy also offers classes in beading and metal clay at this venue.